Investors are giddy now that the Dow’s broken through the mythical 20,000 mark. Many anticipate Trump’s economic agenda will spur the economy. 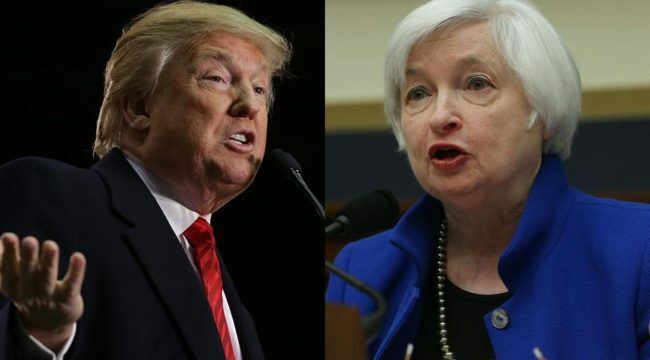 But the most decisive factor in the implementation of the Trump economic plan is the reaction of the Federal Reserve. While a Fed rate hike in December was basically a certainty, the path of rates in 2017 following the December hike will be critical to the success or failure of Trump’s plans. The Fed can choose to be highly accommodative in the face of Trump’s larger deficits. In effect, the Fed will not anticipate inflation, but will wait until it actually emerges. Actual inflation is still below the Fed’s target inflation rate of 2%. Since the Fed is targeting average inflation of 2%, it could allow inflation to run above 2% for a while, which would be consistent with 2% average inflation, given today’s lower level. The Fed also seeks negative real rates as a kind of stimulus measure. Negative real rates exist when the rate of inflation is higher than the nominal interest rate. This condition can exist at any level of nominal rates. For example, inflation of 3% with nominal rates of 2.5% produces a negative real rate of 0.5%. Likewise, inflation of 4% with nominal rates of 3.5% produces the same negative real rate of 0.5%. No doubt the Fed does not want inflation of 3.5%. However, they can achieve negative real rates at any level by using financial repression to put a lid on nominal interest rates. This is done by forcing banks to buy Treasury notes even if the Fed’s balance sheet is stretched. It amounts to a kind of “shadow QE” using the bank balance sheets to park bonds instead of the Fed’s balance sheet. This kind of accommodation to higher deficits is also called “fiscal dominance,” an idea sketched by former Fed governor Rick Mishkin and his colleagues in academic literature. The idea is that Fed independence is mostly a mirage and the Fed will do what is needed to facilitate the fiscal wishes of Congress despite protests to the contrary. Under fiscal dominance, low inflation is allowed to persist for an extended period of time. It will gradually erode the real value of the dollar and dollar-denominated Treasury debt. This is how the U.S. reduced its debt-to-GDP ratio from 1946 to 1970. The problem with this “high pressure” approach is that inflation is not purely a monetary phenomenon, but it is also a behavioral phenomenon. Money printing alone does not produce inflation. The money printing must be combined with the willingness of individuals to borrow, spend and invest. Such willingness is largely psychological — dependent on Keynes’ animal spirits. However, once expectations shift from deflationary to inflationary scenarios, they are hard to shift back again. This could lead to a situation in which inflation expectations shift from 1% to 3%, but then shift quickly to 5% or higher. The Fed assumes they can dial-down inflationary expectations from, say, 3% to 2%. But that may be wishful thinking. Any effort to raise rates to deal with higher inflation expectations may have the opposite of the intended effect as consumers view higher rates as a validation that inflation is getting out of control. This is exactly what happened in 1974–81. The Fed started out behind the curve and stayed there until sitting Fed Chairman Paul Volcker’s extreme measures in 1980–81. Alternatively, the Fed could choose to lean into prospective inflation from Trump’s policies by aggressively raising rates in 2017. This policy would be based on Janet Yellen’s reading of the Phillips Curve and the well-accepted notion that monetary policy acts with a lag. With unemployment at post-recession lows and initial claims for unemployment benefits at all-time lows, Yellen’s analysis is that inflationary pressures from increasing wage demands are just a matter of time. Since monetary tightening works with a six-to-twelve month lag, it’s important to raise rates now to keep ahead of that inflation. Independent of the state of the labor markets today, the Fed is desperate to raise rates as much as possible. This should allow it to have some dry powder available for rate cuts in the next recession. By Fed reckoning, the euphoria in the stock market after the election of Trump counts as an easing of financial conditions. Such easing is the perfect cover for an offsetting tightening by the Fed. The Fed will pursue a delicate balance between easing (from stocks) and tightening (from rates) that will allow it to achieve its rate normalization goal without putting the economy into a recession. The last wild card in this mix is the dollar. A tightening cycle by the Fed will make the dollar stronger. This is deflationary because the U.S. is a net importer and a stronger dollar makes imported goods cheaper for U.S. consumers and other participants in the global supply chain. The combination of a stronger dollar, imported deflation, and higher rates in an already weak economy could tip the U.S. into a recession. And some consideration must be given to the worst possible economic outcome: stagflation. That is the unhappy combination of higher inflation and low real growth or recession. Trump’s big spending plans and animal spirits could produce the inflation while Yellen’s rate hike and tight money produce the recession. A version of this played out in the United States from 1976–81. On top of the macroeconomic risks, systemic risk is as dangerous as ever. It could come to play a large and unexpected role in Trump’s economic plans. Too-big-to-fail banks are bigger than ever, have a larger percentage of the total assets of the banking system, and have much larger derivatives books. In complex dynamic systems such as capital markets, risk is an exponential function of system scale. This means that the larger size of the system implies a future global liquidity crisis and market panic far larger than the Panic of 2008. The ability of central banks to deal with a new liquidity crisis is highly constrained by low interest rates and bloated balance sheets, which have not been normalized since the last crisis. In the next panic, which could come at any time, central banks will turn to the IMF to provide needed liquidity. That liquidity will take the form of the issuance of trillions of special drawing rights, SDRs (world money). This emergency SDR issuance will be highly inflationary, and effectively end the role of the U.S. dollar as the benchmark global reserve currency. There are many potential catalysts that could trigger such a crisis, including a Chinese devaluation of the yuan, a banking crisis, failed gold deliveries, an emerging markets dollar-denominated debt crisis, a natural disaster, etc. The catalyst for such a panic is irrelevant — what matters is the instability of the system as a whole. When the catalyst is triggered and panic commences, impersonal dynamics take on a life of their own. These dynamics are indifferent to the political ideology or public policy of politicians. A Trump administration could quickly be overwhelmed by a global liquidity crisis as the Bush administration was in 2007-08. In such a case, the global elites operating through the IMF, BIS and G20 will dictate solutions since they control the remaining liquidity levers, especially SDRs. Trump could go along with the elite solution, which would involve cooperation with China, or he could fight the elites, in which case a new Great Depression could result. Taking these various vectors into account, this is the most accurate assessment: The global economy is poised on a knife-edge between inflation and deflation. The inflationary vector could dominate quickly, based on a combination of Trump deficits and Fed accommodation. Conversely, the deflationary vector could dominate based on fundamental factors such as a strong dollar, deleveraging, demographics and technology combined with premature Fed tightening. Waiting in the wings is a systemic crisis, which could result in inflation (due to massive SDR issuance) or deflation (due to lack of a coordinated global response). You should prepare for both.